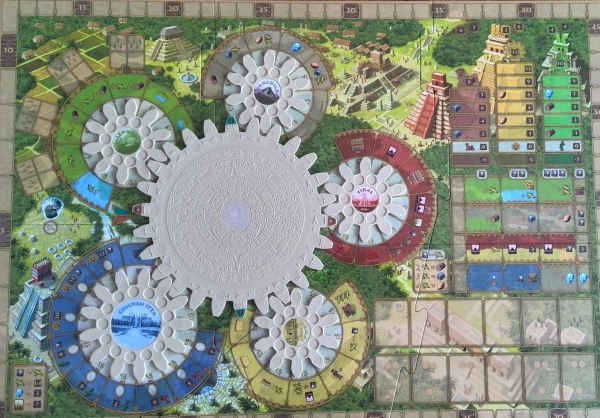 Tzolk’in: The Mayan Calendar is a moderately complex board game that plays in less than two hours. It uses worker placement in a novel way that will appeal to experienced gamers, while not being too complex a step up for those who have played some classic gateway games already (Carcassonne, Ticket to Ride etc). 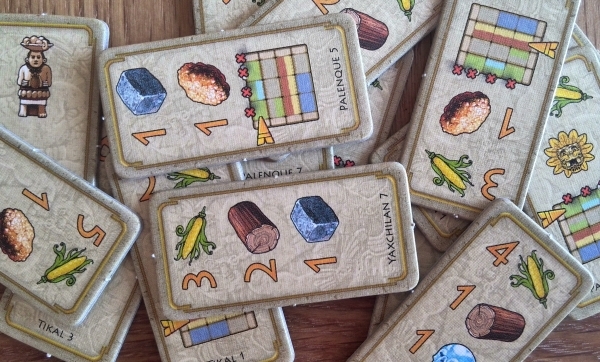 While not for beginners, Tzolk’in isn’t the most complicated game in the world. However it is difficult to play well; getting all your ducks in a row can be a real challenge, while there are a lot of options to choose from that can seem equally tempting. Scores of 30-40 for beginners are common, while more than 100 is feasible for a strong player. This could discourage more competitive people if you’re mixing abilities in a single game. But the Mayan theme is original and well realised, while the bling is more than shiny enough to get even the most hardened gamer to sit down at the table. From the board’s integrated plastic cogs (yup, real actual cogs) and lovely art to the colourful chits and blue plastic skulls, Tzolk’in is an absolute joy to gaze upon. And despite a multitude of ‘bits’, it sets up and packs down pretty quickly too. In the first game turn, player’s will place some of their playing pieces onto the game’s five placement cogs; once everyone has placed, the main cog is turned – moving all the placed pieces around on their cogs one space and making a particular new action available for each one. On subsequent turns, players either add more pieces to the cogs or remove some and take the actions. The longer you leave them on a cog, the better the available actions become. After about 25 turns of this, you see who’s won. Simple! There are no player mats so when teaching you simply sweep across the main board, section by section. Different areas of the board are nicely colour coordinated to make things easy to associate with each other. For example, each cog has one or two Technology Tracks associated with it. If you advance on these tracks, you will get bonuses when you do an action on those particular cogs. To make this as clear as possible, the Technology Tracks match the colours of the cogs they’re associated with. Each player’s turn is relatively quick and there is no hidden information, so people tend to pick the basics up quickly as they see a lot of turns happening. There can definitely be some analysis paralysis for slower, thoughtful players, especially as someone else’s placement could scupper your best made plans and lead to a last minute rethink. Also most in-game values (exchange rates, victory point values etc) are clear on the board itself, and there’s a very handy player aid for each person, so once you’ve played a few times you won’t need to reach for the rulebook very often at all. The trickiest thing for most new players is working out how to, and then remembering to, get victory points! You can get caught up experimenting with the multitude of available actions, trying a little of everything, then suddenly realise the game is almost over and you have very few scoring opportunities open to you. The cog mechanism includes a very nifty game clock, which makes it clear how long the game has to go – you just have to remind newbies to pay attention to it. It’s important to get across how scoring happens and how these opportunities relate to each other. The main areas are the Monuments (end game bonus tiles), temples and one particular cog (Chichen Itza, or chicken pizza, or ‘the blue skull one’). The first two are likely to be key to most strategies, while the latter can be a very easily played single-source strategy for a new player (if you let them exploit it – which may be worth doing if you have one new and inexperienced gamer). 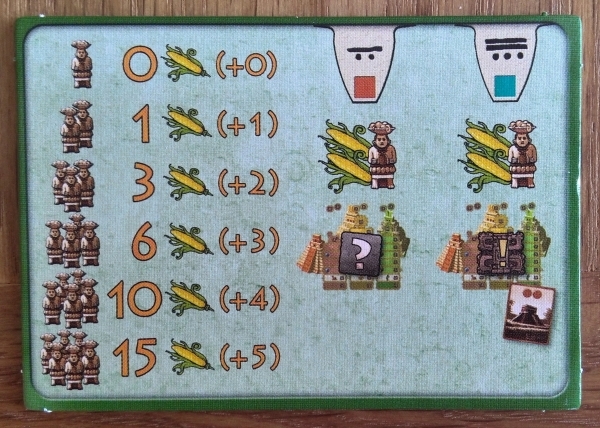 There’s a brilliant setup mechanism in Tzolk’in. Instead of each player getting a set amount of money etc, each instead chooses two of four randomly dealt starting bonus tiles. Some of these will give resources and/or corn (Tzolk’in’s currency), but others also give a foot-up on either a Technology or Temple Track. In a game with so many actions and strategies to choose from, this can give you a valuable steer before the game begins. The writer: I’m finding Tzolk’in a fiendishly difficult game to master, but luckily I’m having no problem finding people to practice against. Sometimes I simply cloud over, failing miserably to get anything going, while at other times everything just slots into place. I’m also surprised at how fast it plays. It looks like its going to be epic once it’s set up, but even in our notoriously slow groups it sticks close to the suggested 90 minutes. And coming from nowhere with a couple of massive turns at the end is always a really great gaming feeling. The thinker: This is a game I warmed to immediately. From the first turn its possible to see much of the game extending out in front of you; but competition for placement on the cogs, occasional double cog turns (possible if someone plays the ‘take first player’ action) and having to ensure your desired bonus tiles to guarantee points – not possible for at least a few turns – keeps it exciting. Tactics can also come into play though, especially when the optimal route to meet your strategic goals is blocked. This makes it a mouthwatering challenge. The trasher: Tzolk’in surprised me. While the thinkers plan their strategies from the outset, it doesn’t mean there’s not room for a good tactical player. This can be a classic ‘do what the others aren’t doing’ game, while scuppering other people’s plans through careful buying and placement can work a treat. I may not be able to get as high a score, but if I can drag the others down to beat me I can still win! However, I do have to be in the right mood to play because, with the best will in the world, it’s still a cube pusher at heart. The dabbler: This game can feel extremely frustrating; you can go a few turns seemingly doing lots of stuff, only to find you’re only really back where you started. Get corn, spend corn, get more corn, get no points, grrr. The blue skull strategy is sometimes easy points (buy skulls, while moving on the cog, then place them, rinse/repeat) but is also easily blocked, and a bit dull, so I don’t stick with it now. I doubt I’ll ever win at Tzolk’in, bit it’s gorgeous and fun and plays fast for what it is. So for now I’m always up for a game, but it may get frustrating over time. As someone who is often accused of being cynical, I wasn’t surprised when people immediately hailed Tzolk’in’s cogs a revelation – then almost as quickly afterwards labelled them a gimmick. In truth, both extremes are well off the mark. Worker placement is probably my favourite mechanism and I’m always up for playing a new game in the genre, whether it’s considered original or not, so when I saw all the fuss surrounding Tzolk’in I couldn’t wait to play. Luckily I got to play it during Essen last year and like so many was immediately taken with it – and then the backlash began. Kicking back against over enthusiasm is hard not to do if you’re not in the happy camp – I’ve done it myself (hello Thunderstone!). But on this occasion I was a little confused. Whether you think Tzolk’in’s cogs are original or gimmicky doesn’t matter at all in terms of gameplay, it’s simply a component choice. They work, they look great (without incurring a price hike) and they make what would otherwise be a laborious task incredibly easy. What’s not to like from a gaming perspective? You need to look beyond the cogs to judge the game and it hasn’t risen into the BoardGameGeek Top 20 for nothing. Good games in this genre are about meaningful decisions, variety and multiple paths to victory – all of which Tzolk’in has in spades. When you add the lovely set of components, a beautiful board with all the right info on it and a solid rulebook you’ve hit pay dirt. The cogs are really just part of the streamlining that mark this out as an A-lister, as well as a nice gossip boost that helped get it recognised. But what Tzolk’in isn’t is original in terms of what you’re doing. Once you get past the great theme, lovely art and fancy cogs you’re essentially putting workers out to get stuff to get victory points. That’s it. But that doesn’t mean it isn’t a great game – not every board game is going to break the mould, nor does it need to. By now it’s not going to surprise anyone that I rate Tzolk’in: The Mayan Calendar a solid 9/10, currently about a point above its BGG average. But as this is my genre, that seems about right. I’ve played eight times so far and still feel very much a novice, despite having the occasional solid game. Because learning how to score points is only half the battle; you have to execute it while everyone else is trying to do the same thing, scuppering your plans on regular occasions (whether they know it or not). While this level of competition is clearly most evident in three or four-player games, the two-player experience is still a fun one and I’d certainly still recommend it for couples. The amount of end game scoring tiles is limited depending on the number of players, while ‘dummy’ workers are placed on the cogs if playing with less than four to throw some extra spanners in the works. This balances well for three and makes the two-player game a more puzzley but equally enjoyable experience. I’d recommend Tzolk’in to most gamers, with the exception of players who hate worker placement as a mechanism, need luck/dice to have fun or who crave direct confrontation. If you’re new to gaming you might want to find someone who can teach the game, or at least know in advance this is going to be a challenge to pick up – but it’s worth it. 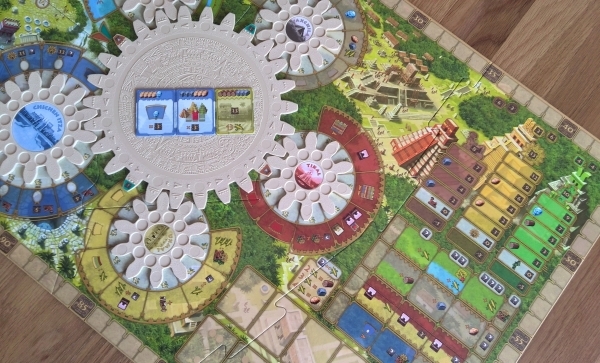 This entry was posted in Board games, Games and tagged Board game review, boardgame review, Tzolk'in, Tzolk'in review, Tzolkin the Mayan calendar by Chris Marling. Bookmark the permalink.